Subject: Proverb / ethics emblem : 'Staten en Ampten. - L'Ignoranza corre, la Prudenza lentamente segue il passo - De Dwaesheyt loopt / de wijsheyt gaet: En dat is vry den besten raet.' (Phases and Professions. - Foolishness is in a hurry, wisdom takes the time. That is the best advice.) This plate shows a being with an owl's head and eagle's wings. On the rear a second emblem: 'L'araigne mange la mouche, & le lizard l'araigne, &c. - De spin die eet de vliegh / de hagedis de spin, die heeft het grouene wout / en al de werelt in' (The spider eats the fly, the lizard eats the spider). Condition: Very good, given age. Left edge uneven from binding, Mild stains in the bottom margin. General age-related toning and/or occasional minor defects from handling. Please study scan carefully. Medium: Original copperplate engraving on a verge type handlaid paper. Size (in cm): The overall size is ca. 24 x 41 cm. The image size is ca. 13 x 13 cm. Size (in inch): The overall size is ca. 9.4 x 16.1 inch. The image size is ca. 5.1 x 5.1 inch. Description: This old antique engraved copperplate print and accompanying poetry originate from 'Alle de Wercken van den heere Jacob Cats.....', (Complete Works of Jacob Cats) which was published from 1655 on. This plate is from a 1726 edition. The emblems depict lessons of many aspects of life. Each emblem typically has more than one meaning as Cats' poems talk about ethics, wisdom and morale from the perspective of love, religion and society. His work has often been critisized, but contains a treasure of truth and symbolism, often as relevant as it was during the times of it's creation. We might carry this item from a smaller size edition and a 19th c. ed. with steel engravings as well. Inquire if interested. Artists and Engravers: The Author is Jacob Cats, also known as Father Cats (born Nov. 10, 1577, Brouwershaven, Zeeland, Spanish Netherlands - died Sept. 12, 1660, Zorgvliet, near The Hague) Dutch poet. A magistrate and high official, he was enormously popular as a writer of emblem books, consisting of woodcuts or engravings with verses possessing a moral. 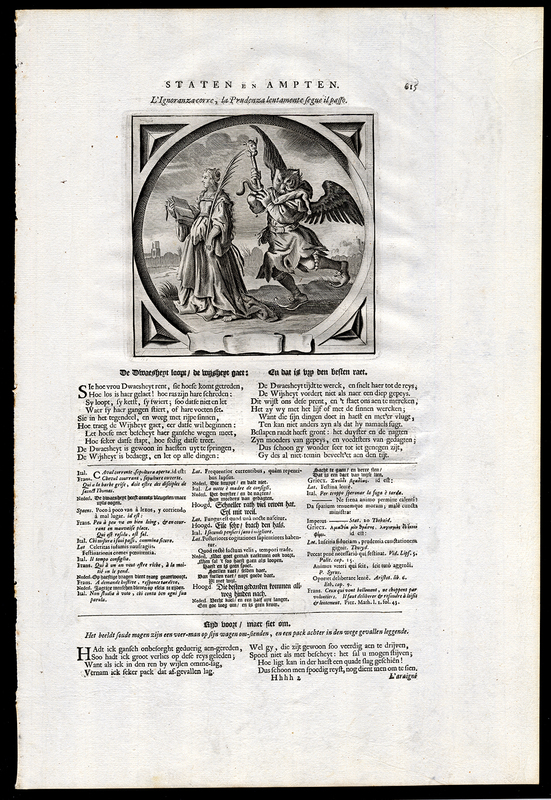 His Mirror of Old and New Times (1632) contains many quotations that have become household sayings in the Netherlands, and he used it to express the ethical concerns of Dutch Calvinists, especially about love and marriage. The famous poetry by Jacob Cats is often accompanied by well engraved images after the design of Adriaen van de Venne. Not all engravings have been signed, but engravers indicated include J. Swelinc, I. Matham, Wil. Hondius, C. v. Quiborne, D. v. Bremden & possibly others.